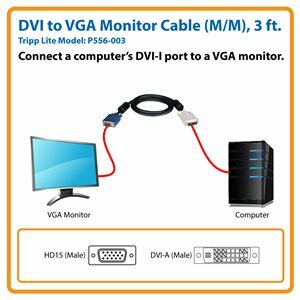 Tripp Lite's 0.91 m (3-ft.) DVI to HD15 cable allows PC users with a DVI-I port to connect to monitors with a VGA connector. Gold-plated contacts ensure excellent conductivity, while double shielding (foil and braid) provides maximum EMI/RFI protection. Both the DVI and HD15 connectors are molded and have integral strain relief for long life reliability. Tripp Lite’s P556-003 DVI to VGA Monitor Cable carries premium video signals from your computer’s DVI-I port to a VGA display, projector or TV, making it ideal for video presentations, point-of-sale displays, classrooms and other similar applications. It’s also the perfect replacement for worn-out power cords. This cable supports analog signals only and is PC- and Mac-compatible. The P556-003 meets all DDWG DVI standards. This three-foot molded cable features premium foil-and-braid shielding and mini-coax (RGB) and paired video wire construction for top-of-the-line signal quality and protection from EMI/RFI interference. Nickel-plated connectors with gold-plated copper contacts ensure excellent conductivity. Integral strain relief ensures the cable and connectors last a long time. When you choose this genuine Tripp Lite cable, you get superior performance plus peace of mind. We’re so confident of its quality that we warrant it to be free from defects in material and workmanship for life! The P556-003 is also manufactured in compliance with strict RoHS specifications, reflecting Tripp Lite’s commitment to environmental responsibility. P556-003 DVI to VGA Monitor Cable (DVI-A to HD15 M/M), 3 ft.